Katayoun Vaziri was born and raised in Iran and is currently based in New York. Vaziri draws on a wide range of cultural references to question the linearity of political and social narratives. 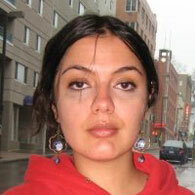 She received an MFA from Yale University in 2009 and a BFA from Tehran University in 2005. Her work has been featured in exhibitions in San Francisco, London, and Dubai and she has held residencies at the Skowhegan School of Painting and Sculpture in Maine in 2010, the Constance Saltonstall Foundation for the Arts in Ithaca, New York in 2011and over the Fall 2012, she was visiting lecturer at Ohio State University. In addition to her artistic practice, Vaziri is segment producer for BBC Farsi TV, focusing on art scene of New York. She is currently working on “I ran into Iran”, a radio pod cast, which is part of Creative Times’ Reports series.